In April 1942 twenty four year old Lale, a Slovakian Jew, is crammed into a wagon used to transport livestock, with countless others. Thinking he is saving his family, Lale has volunteered for what he believes is a work detail and he’s unaware his destination is Auschwitz, then on to Auschwitz-Birkenau. Lale’s first bewildering experience on arrival at the concentration camp is having a number tattooed on his forearm, stripping him of his individuality. When Lale wakes in the night needing to relive himself and witnesses three prisoners shot for no reason by laughing guards he makes a vow to himself. I will live to leave this place. I will walk out a free man. If there is a hell, I will see these murderers burn in it. Lale has a strong survival instinct and his deferential attitude, the fact he’s fluent in several languages and obviously well-educated, means he is spared the worst of jobs. Eventually he is given the task of tattooing the new arrivals, even the women which he hates. He first sees Gita when he’s obliged to tattoo a number on her arm. Being the Tätowierer brought its own benefits, placing him under the protection of the Political Wing instead of being at the total mercy of the SS. He can travel around the camp and has special privileges which allow him, through luck, resourcefulness and sheer bravery, to secretly help the other inmates by supplying them with extra food and medicines. Even though everyone knows, if only basically, what happened in the concentration camps during WWII, knowing this account is from one man’s personal experience makes it all the more shocking and stark. The horrors, atrocities, cruelty and the fight for survival. More even than that, it’s a story of courage, hope and against all odds, a love story. They have both withstood, for more than two and a half years, the worst of humanity. The Tattooist of Auschwitz isn’t as hard hitting or graphic as other books on the same subject. As his story was told to the author by Lale himself, the narrative concentrates on his own experiences, his feelings and fears for Gita, as well as the people who become his friends, and encompasses those Nazis he has the misfortune to come into contact with. We see events and life in the camp through his eyes, rather than the broader spectrum. This is definitely a story well worth the telling. The additional information, pictures and afterword at the end round it off nicely and add to the reality of this unforgettable and inspiring story. There are more lovely pictures of Lale and Gita in happy times on the author’s website. I am a Native of New Zealand now resident in Australia, working in a large public hospital in Melbourne. For several years I studied and wrote screenplays, one of which was optioned by an academy award winning Screenwriter in the U.S. In 2003, I was introduced to an elderly gentleman “who might just have a story worth telling”. The day I met Lale Sokolov changed my life, as our friendship grew and he embarked on a journey of self scrutiny, entrusting the inner most details of his life during the Holocaust. 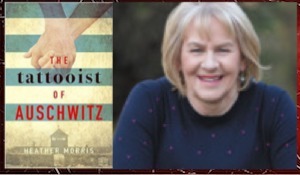 I originally wrote Lale’s story as a screenplay – which ranked high in international competitions – before reshaping it into my debut novel, The Tattooist of Auschwitz. Keep seeing such amazing reviews for this book – I must get round to reading it. Sounds like a powerful book. Shall be adding this to my must read list. Looks like a fascinating read Cathy.. thank you.. Wonderful review, Cathy! I loved this one too! Thank you! It’s a truly amazing story. My mum has recently got this book! 🙂 It sounds fab and this is a wonderful review. Thanks, Chrissi 🙂 I hope your mum enjoys it. I would really like to read this book and what a privilege to to be able to preserve Lale’s story. Absolutely! The whole thing is incredible really and the old photographs just add the finishing touch. This sounds like a beautiful story, Cathy. It really is, and a testament to the human spirit and endurance. Thanks, Beth 🙂 I hope you enjoy it as much as I did. This book is on my TBR list. Your thoughtful and thorough review tells me I need to read it soon! I hope you enjoy it, it’s a really moving story. This is actually the next book on my list! I have been reading WWII this month, there are so many. But I have found some that have moved me. Right now it’s Thrown Upon The World, thrownupontheworld.com for it’s info. Two families uprooted by the war around them and their stories are sobering. George Kolber is the author, a definite read if you read this topic. I hope you enjoy it. I’ve just bought The Choice by Edith Eger, again based on a true story.